Testing bare fiber just got a lot easier and faster. 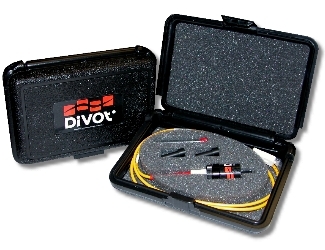 The Divot® Bare Fiber Adapter (Tester) accepts cleaved and non-cleaved fiber, requires only 3/4” of bare fiber exposed and has a typical insertion loss of less than 0.5 dB when using cleaved fiber. No messy gel applicators or reservoirs to fill. Simply strip your fiber and insert. The Divot® Module can be easily disassembled in order to replace the internal cartridge. Every insertion of bare fiber will use a small amount of coupling compound from the cartridge. A cartridge will typically result in a minimum of 500 insertions. To replace a cartridge, simply disconnect the patch cable from the universal LiteLOCK® interface by rotating the dial to the left. Unscrew and remove the end cap on the module to expose the OCC (Optical Coupling Compound) Cartridge. Pull the cartridge out of the sleeve and replace with a new cartridge. Screw the end cap back onto the module. Insert the the connector with the red boot on the patch cable into the universal LiteLOCK®interface and rotate the dial to the right to secure. Includes: Case, Divot® module with 2 patch cables, 2 OCC Cartridges, Vial of Clean-out Wire and Instruction Sheet. Many combinations available, not all listed. Please contact us if you need an combination that is not listed. Includes: Case, Divot® module with 3 patch cables, 2 OCC Cartridges, Vial of Clean-out Wire and Instruction Sheet. Many combinations available, not all listed. Please contact us if you need an combination that is not listed.